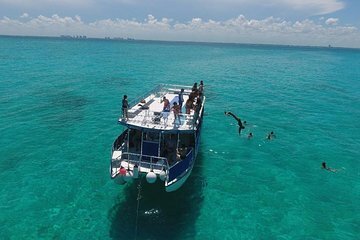 Ande de catamarã moderno de Cancun a Isla Mujeres e passe o dia mergulhando de snorkel no deslumbrante recife de corais. Viaje pelos canais de mangue da Lagoa Nichupte enquanto saboreia coquetéis no bar aberto a bordo. Um buffet de almoço inclui peixe fresco e fajitas de frango. Seu guia permite fazer compras na ilha e faz uma parada na bela North Beach em Cancun. I booked this tour based on the design and size of the catamaran and positive feedback from others which the vendor a high rating. I received confirmation and location as to which marina we would sail from. A couple of days before the sailing I received a message that stated our sailing location and time had changed and that we were to report to a different marina. There was no mention of a tour operator change. On the day of the sailing we left early to ensure we would arrive with plenty of time. The local transport dropped us at our marina and we looked for our boat. Spanish is not our first language and after some discussion we determined that we were dropped at the original marina www were to sail from. We also determined that all sailing were cancelled due to heavy winds and seas. Hundreds of people were leaving because of the cancellations. We did not want to miss our scheduled sailing time, so we left and quickly found the correct marina with only a few minutes before the scheduled time. The marina was very busy and chaotic with multiple deep line-ups of people looking to connect with their tour boat. After 25 minutes in a lineup, we were told we were in the wrong line-up and gratefully, the person at the wicket window found our contact person who quickly processed our tickets. With tickets in hand, we waited an additional 30 minutes for the captain to prepare our boat. The boat looked nothing like what the tour operator had promised and appeared to be the smallest catamaran at the marina. Our tour was now with a different tour operator with no explanation. Our tickets showed that we were on an economy ticket and I compared my ticket with that of another visitor. Their ticket stated luxury and I was pointed to a much larger catamaran. It was time for us to start our sailing, so we boarded the very small catamaran which appeared to be about 20 -25 feet long and looked like it could accommodate about 15-20 people at best. We left an hour after the stated sailing time. At this marina, All sailings were on., so we left the marina and sailed towards Isla Mujeres. We were quickly told that snorkelling was cancelled due to strong currents brought upon by the heavy winds and seas. Our small boat reacted quickly to the large waves with everybody getting soaked and almost thrown off the boat. The crew reacted by trying to set up a canvas that would deflect water. They couldn't unravel the canvas as it was bunched up and crew were getting thrown around by the waves. People continued to get soaked and with each wave were getting very anxious including my son who was having difficulty with the large waves. I was also dealing with my professional camera equipment which was able to store inside the cabin. My son spent the remainder of the trip inside the cabin. This was not our first catamaran trip. Crew came to us individually to try and 'help' us but would not cancel or turn to shore. One of the crew told me discretely that we should not have sailed. We arrived at Isla Mujeres after a tumultuous and harrowing trip and returned to shore via government ferry. The catamaran trip was a total write-off for my son and I.
I'm very disappointed with the tour company and vendor. Promises were made and were not followed up. I am still waiting for our dialogue to come to a reasonable conclusion. Tour operator was changed without notice. Marina was chaotic and we were shunted to a small vessel and an economy booking without any recourse. Tour company continued to sail in spite of heavy winds and seas. Other major tour operator cancelled sailings..why did this company imperil their guests? I do not recommend this tour. Stay away! !